Atmel's AVR microcontrollers guarantee fast code execution combined with the lowest possible power consumption. 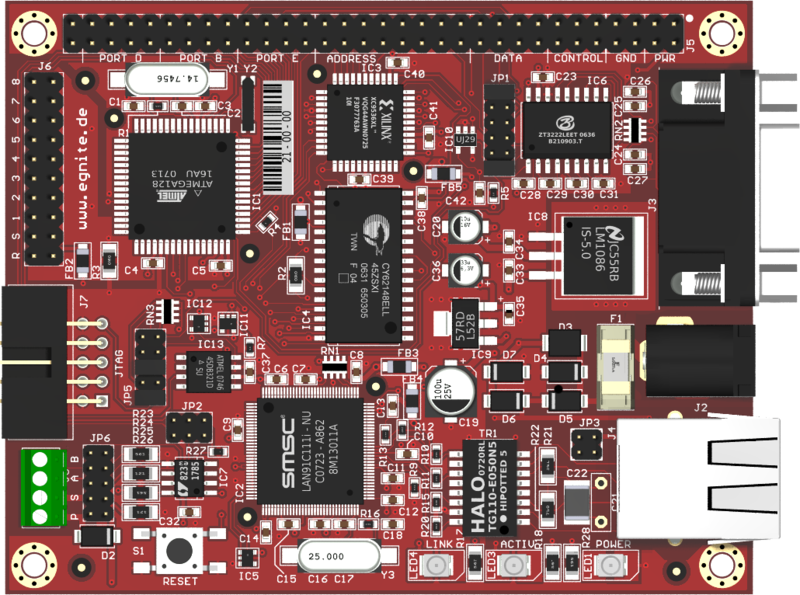 Ethernut 2.1 is a single board computer with an extended temperature range, which integrates the 8-bit AVR ATmega128 into an Ethernet network. In addition to 100 Mbit Ethernet, the board offers a larger memory than its predecessor, Ethernut 1. With the extra RS-485 interface and the extended temperature range from -40 to 85 °C, Ethernut 2.1 is predestined for industrial applications. 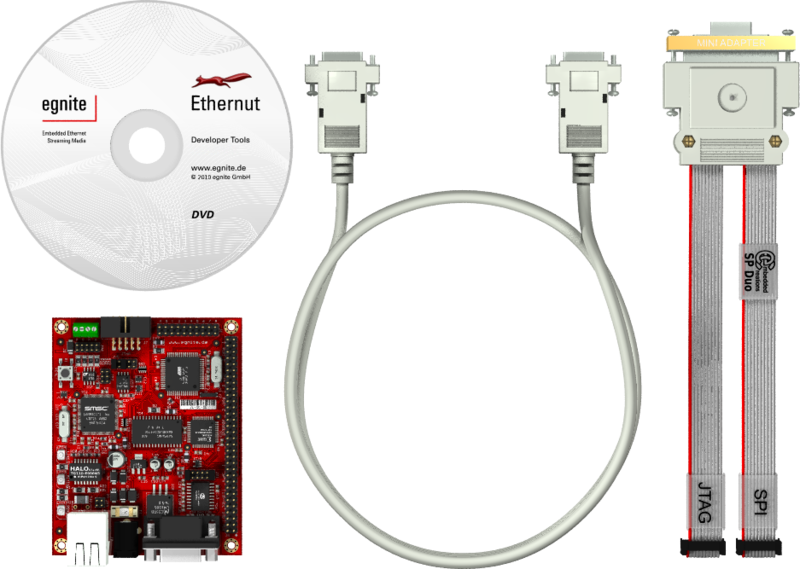 Like all other Ethernut boards, it provides an extension connector for attaching additional hardware. 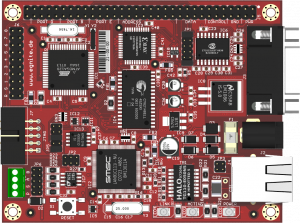 Hence it is suitable for both the prototyping of your own hardware as well as for direct integration into your finished product. 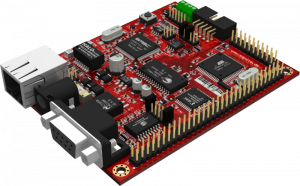 Ethernut boards come in use where robustness, reliabilty and long-term availability play a vital role. Our in-house quality control procedures guarantee a consistently high level of reliability. Application development is carried out in the high level programming language C, using either free GNU tools or the commercially supported ImageCraft compiler. An active Open Source community developed and managed Nut/OS, a cooperative multithreading operating system with TCP/IP stack, which was specially designed with tiny embedded systems in mind. The well documented source code provides a convenient user interface, which is very similar to the C programming of desktop PC’s. Programmers will therefore quickly feel at ease operating this. Although pre-configured for Ethernut 2.1, all important settings can be customized with just a few mouse clicks with an easy to use graphical interface available on Linux, Windows and Mac OS X PCs incorporating any special requirements. A complete Internet enabled web server needs less than 60 kByte Flash and 12 kByte RAM. This leaves enough space for ambitious product ideas, including a boot loader for the update of firmware via the network. Many useful example applications are included in the distribution. The entire source code for the target system, as well as the hardware design, have a permissive BSD licence. This is available for commercial products without any licence fees. In contrast to some other Open Source licence models, there is no obligation to publish your own source code enhancements. Ethernut 2.1 is shipped with a pre-installed application called Basemon, that performs a self test and provides a small webserver. How to put Ethernut 2.1 into operation, first steps with Basemon, as well as error handling, are described in the Ethernut 2.1 Hardware Manual. To develop applications in Nut/OS, you should start reading Nut/OS on Ethernut 2, which explains how to configure and set up Nut/OS. The software manual describes the basic procedures of Nut/OS development. A detailed description of all Nut/OS functions can be found in the Online Reference API. The NutWiki provides an extensive collection of example code as well as further resources for developers. All available documentation can be found on the Ethernut 2 page on ethernut.de. Executable installation for Windows PCs.